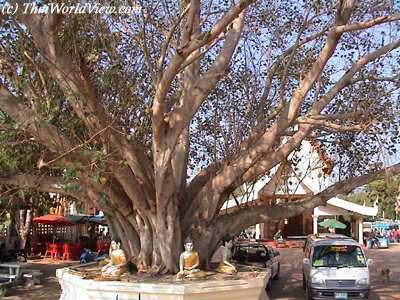 In a Thai Buddhist monastery there is always a banian tree ("BO" - ต้นไทร). Buddha reached the enlightenment under a banian tree ("BO"). This tree is often enveloped with a cloth tinted with the orange Buddhist colour. 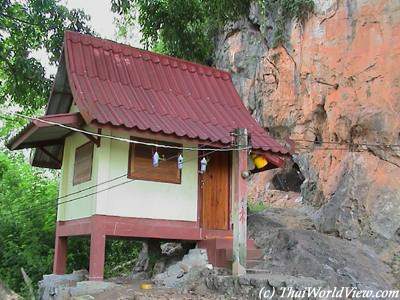 The "KUTI" (กุฎิ) are the houses for monks in Thai Buddhist temples. It can be a small room for one or several persons. These rooms are quite small and empty because monks are not supposed to make anything in their room except meditating and sleeping. Often monks have their own room and novices share their rooms. 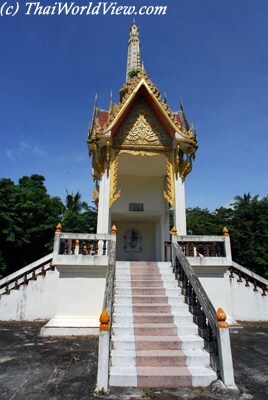 In a Thai monastery there is an abbot ("CHAO AWAT" - เจ้าอาวาส), who is responsible of the well-being of the community. The laymen in troubles come to the temple in order to ask for the abbot's advice. The abbot is often a quite old man with a wisdom reputation. Such monks are called "LUANG PU" (หลวงปู่). Each monk has only a limited number of robes. 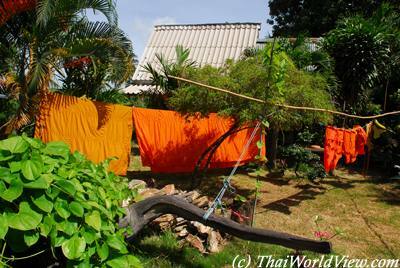 So near monks' room, it is very common to see cleaned robes hung out in the sun. In year 2008 a Thai fabric designer has disclose a new line of saffron-coloured robes infused with bug repellent to keep mosquitoes from biting Buddhist monks. 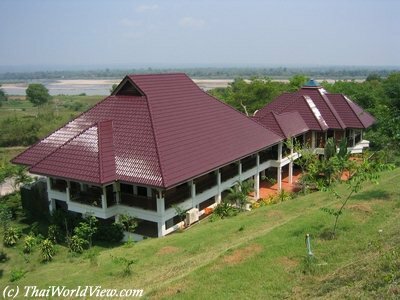 Abbots of famous temples can have tremendous house with cars and all modern facilities. 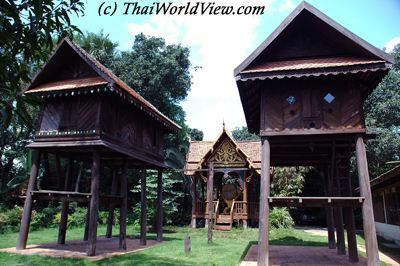 There is also a responsible for temples in a district ("CHAO ATHIKAN" - เจ้าอธิการ). Monks are eager to speak with foreigners. Monks are often people with the greatest knowledge in villages. Some are able to speak English. 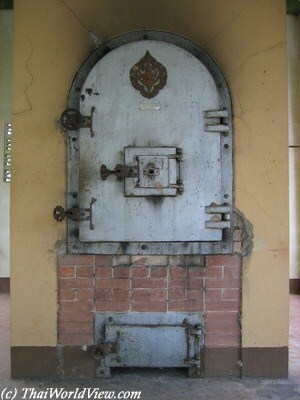 In a Thai Buddhist monastery there is often a crematorium to burn corpse of dead people. This building is easily recognisable because it has a tall chimney. In a Thai Buddhist monastery there is often a library ("HO TRAI" - หอไตร) where books about Buddha teachings are kept. The library is often built on piles in a pond to prevent bugs to destroy the sacred texts. 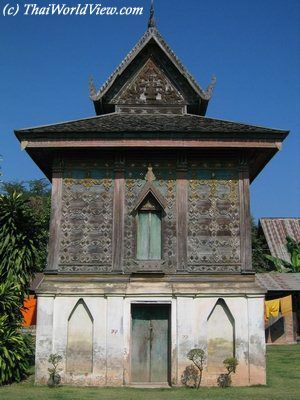 Most temples also contain a library, usually a decorated wooden building raised on a podium. 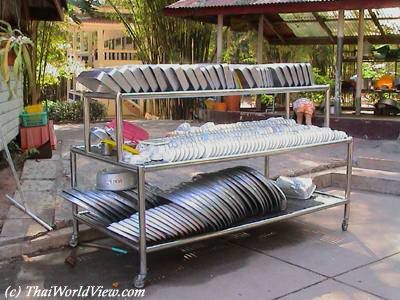 In a Thai Buddhist monastery there is sometimes a kitchen and refectory in case of many monks. In very big temples, food is cooked in the temple by monks and laymen. Food can be obtained by the alms round ceremony ( "TAKBAT" - ตักบาตร). or people bring food in the morning at the temple while the monks are praying. In rural places, the school was often in the monastery. Before the creation of school last century by Rama V, the only school were in temples. Up-country temples are still the centre of the village.